Having a party, wat to watch the game, or for any reason at all. The Backyard Movie package is perfect for any size yard. Gather up to 50 of your closest friends and family, set out some chairs and/or blankets and settle in. We take care of the rest. Prices starting at $299* including delivery! 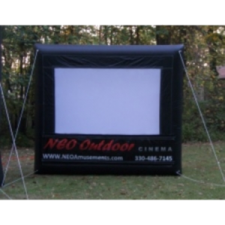 NEO Outdoor Cinema provides 12′ tall screen with an 8′ x 5′ viewing area. 150 watt sound system for great movie quality sound in your own back yard. 1800 lumen projector, DVD or Blue Ray player, table, cables, and any other necessary equipment. Our event staff will deliver, setup, and test the equipment and instruct you on how to use the equpiment before they leave. Event hosts are available for your backyard for an additional charge.